A stopgap upgrade to the KV series was the short lived KV-85 or Objekt 239. This was a KV-1S with a new turret designed for the IS-85, mounting the same 85mm D-5T gun as the SU-85 and early versions of the T-34-85. 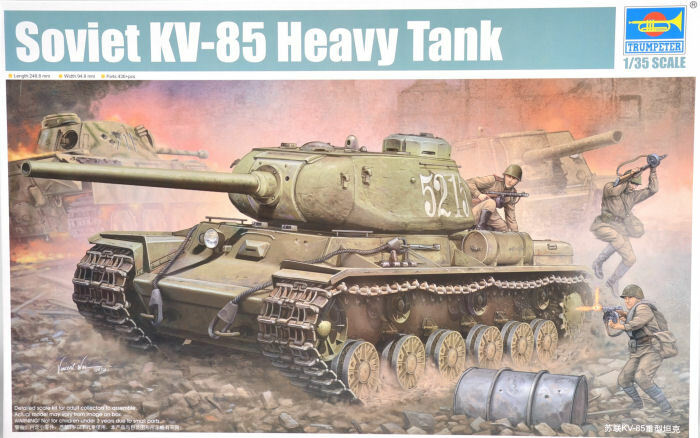 Already high demand for the gun slowed production of the KV-85 tremendously, and only 148 were built before the KV design was replaced. The KV-85 was produced in the Fall and Winter of 1943-44. Production was stopped as the IS-2 entered production. The latest KV series kit from Trumpeter consists of 447 plastic parts on 23 sprues, 14 photo etch parts and a metal gun barrel. Markings are provided for 4 vehicles. All parts are very well molded and no flash is present. Clean up should be quick and easy. Fit of the main components is really good. The entire turret assembly is 100% new tooling and looks really good. The cast texture is fine and will look great under paint. Construction is straight forward and you start by assembling the lower hull, adding photo etch details as you go. The kit features individual track links and here again the detail is really nice. No need for aftermarket tracks here. The kit also gives you the option of using a one piece plastic main gun barrel or a turned metal barrel. Definitely another winner from Trumpeter! My sincere thanks to Squadron Mail Order for this review copy!